Motor trips and burning lips and burning toast and prunes..."
- Bob Hope, from his signature song, "Thanks for the Memory"
It's tough to cram 100 years into 86 minutes. For the mathematically challenged, that works out to a paltry 51 seconds per year of a centenarian's life. And when the life is jam-packed with as many films, radio shows, TV specials, overseas tours, and golf tournaments as Bob Hope's, not even a classy outfit like A&E's Biography can be expected to do much more than hit the highlights. Bob Hope: America's Entertainer does just that in a breezy, entertaining manner, yet one constantly wishes it would delve beneath Hope's skin and expose the man behind the laughs. It's also too bad the 1998 documentary wasn't updated to include coverage of Hope's death on July 27, 2003, a mere three-and-a-half weeks before this disc's release. A brief coda addressing his passing would have given this film a more complete and definitive feel. Still, America's Entertainer provides a comprehensive and often celebratory look at the life of a man who made more than 50 films, appeared countless times on TV and radio, wrote 12 books, entertained 11 presidents, and received 56 honorary doctorate degrees. As narrator Peter Graves notes, that's not bad for someone who never finished high school. Produced with the cooperation and endorsement of Hope's family and containing rarely seen home movies and photographs, this tribute features an extensive segment on Hope's early years�his immigration from England, show business beginnings, and successful vaudeville career�before following him to Broadway and Hollywood, and chronicling the more familiar aspects of his life. Interviews with Hope's wife Dolores and their adopted children, as well as footage of Hope himself describing personal events, add a touch of intimacy to the program. Most interesting are the segments covering Hope's USO tours, which transpired over five wars and provide the documentary with its most touching moments. Seeing such unabashed joy flood the faces of so many servicemen as they watch and participate in Hope's revues emphasizes the immense contribution the entertainer made to our country's military efforts. The program excels when it spotlights such episodes, yet it remains strangely unsatisfying. The dry, clinical tone so typical of Biography becomes tiresome over time, and the documentary lacks any rhythm or flow as it quickly darts between events, almost as if the producers are using a checklist to mark off stages and accomplishments in Hope's life. Granted, just skimming the surface of the entertainer's century-long existence is a daunting task, but the show rarely lingers long enough on any episode or theme to give the viewer more than a hint of Hope's talent or personality. Maybe someday we'll get the cohesive, absorbing biography that Hope deserves. Until then, this nuts-and-bolts effort will certainly suffice and reminds us of all the reasons why Bob Hope achieved such a special place in the hearts and history of America. Image Transfer Review: The documentary makes a nice transition to DVD, looking crisp, clear and bright. While much of the vintage footage from Hope's films exhibits understandable wear and tear, the contemporary interviews enjoy a smooth, vibrant look. Audio Transfer Review: The Dolby stereo track possesses good fidelity and fairly stable levels. Predictable distortion and defects mar some of the older film clips, but Peter Graves' narration is always understandable. Extras Review: Nothing to speak of, besides chapter stops and a teaser for the Biography Channel. 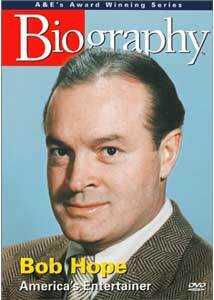 A typical Biography installment, Bob Hope: America's Entertainer lacks depth and warmth, but still manages to provide a comprehensive, informative overview of the entertainer's life. Only Hope's most devoted fans will be interested in purchasing this disc; all others should simply wait for an A&E rerun.